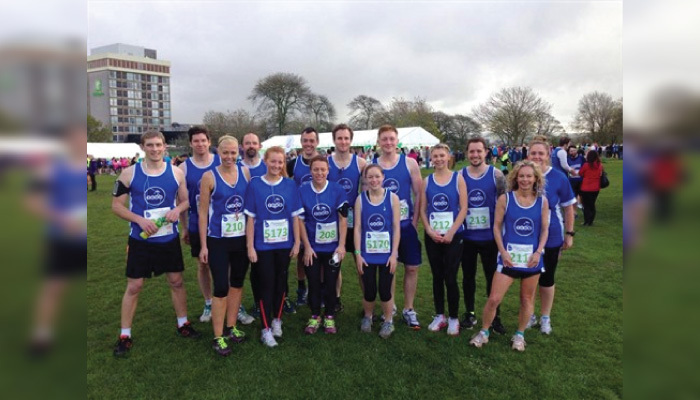 Well, we ended April with the fantastic Team THHN runners excelling at the Plymouth Half Marathon and we hit the ground running as May starts. Before the first weekend in May is over, Luke will have run 100 miles and the Warburton gang will have cycled over 100 miles. Exhausted just thinking about it? Take a few minutes to relax and read more about their antics along with what everyone else got up to in April. And this month Prime Minister, David Cameron, gets a mention too…..
Well what a day it was. A mixed bag weather wise but a great day for fundraising and team spirit. Thanks so much to the organisers of this lovely event for making us an affiliated charity and, of course, to our terrific team of runners who were organised impeccably by Race Manager, Rebecca Davies and Fundraising Manager, Brian Lewis. Thanks also to everyone who contributed to our post-race goody bags for each runner, including Teddy Mountain, 100% Health, Total Produce Devon and Angels Team Rooms. Have a look on our Facebook page for some great pics of the team. Our running team is always delighted to welcome new faces. If you’d like to join us please get in touch. We can help with training and give all sorts of helpful advice if you need it. Our next special event for runners is the Torbay Half Marathon on Sunday 29 June. If you’d like to run for the THHN please e-mail rebecca@thhn.co.uk who will tell you everything you need to know. Our Memory Maker Caravan, donated by the Miss England Beauty Pageant team, continues to provide a truly wonderful place for our families to holiday. Nestled in the gorgeous Finlake Holiday Park it’s warm, comfortable and a real holiday haven. Not only that but it’s now home to a brand new XBOX 360 very kindly donated by Jo Morrison and her colleagues from Exeter University’s Retail Department. It’s also looking fantastic with newly stained decking, thanks to our marvellous caravan cleaner, Artur, who spent Easter getting it all freshened up. During April a family referred by the Lifetime Service and one referred by the Plymouth CLIC Sargent team both got to call it home for a week and, judging by the letter of thanks they left behind, we can safely say that this is one holiday home that is worth its weight in gold to so many people. Torquay Legends Football Match – Saturday 10 May. Tickets for the match are just £3 each and are on sale at the Sportsman’s Arms pub on Laburnum Street, the Bombay Express on Belgrave Road, Torre Trophies and Alberts Bar on Belgrave Road. Should be a fun, family day out. The Hotel De La Mer who welcomed a family from the Bristol CLIC Sargent team. Riverford Torbay and South Hams, Teddy’s Cakes, D&H Fisheries, Save on Meats, Total Produce Devon, Claire’s Cakes, Over the Rainbow Cake Design and Hallets the Bakers for all the delicious goodies they gave to our holidaying families. Everyone involved in our fun run promo photo shoot which took place on Babbacombe Downs. A medley of mini Memory Makers, the wonderful Dougie Worthington of Peacock Dreams Photography and Kate and Ed from the Downs Hotel who gave everyone free refreshments. The fun run itself takes place on Paignton Green on 29 June. STOP PRESS!!! Our amazing friends at Pennywell Farm have stepped in to sponsor THHN for this event! More details to follow soon! Carrie Darby for running the London Marathon for us. THHN volunteers Carolanne & Neil who spent Good Friday cleaning and sorting out our storage lock up. The Babbacombe Bay Marketing Group who donated their left over funds after closing the group. A cheque for £787.10 was presented to Luke. The Marine Hotel in Paignton who ran a raffle for us with all their Tinsel and Turkey trippers last year. They raised a tinsel-tastic £1460. Luke Tillen went to meet Prime Minister, David Cameron, in Downing Street a couple of weeks ago. What a fantastic opportunity to spread the word about the work of the THHN.